At 5 p.m. on September 1, Boston College Magazine sent an email to some 400 alumni who live along the Gulf Coast, from Florida to Texas, offering them the opportunity to apprise the campus and alumni communities of their circumstances and whereabouts. Pertinent email responses are being posted below in the order in which they are received. This is Matthew Joseph (A&S '01) writing from Dallas, Texas. I am a third year law student at Loyola University New Orleans. I evacuated to Houston on Sunday and am now in Dallas with my family. I am safe, but there are still many thousands of people in New Orleans who are without food, water, electricity and security. Most of those people are the poorest residents of New Orleans who had almost nothing to begin with — now they have nothing at all. Please keep them in your prayers. Pensacola was spared the ravages of Katrina, but it is no great source of joy because we grieve for the losses of our gulf coast neighbors. If there are any BC alums in the affected area who need housing, please inform them that Elizabeth Vickers, BC Nursing '50, and her husband have room to share. 1-850-432-9743. Dear Friends - I have spoken very briefly with my mother who remains safe with some family members in the north Gulfport area. A truly brave and heroic neighbor named John Rogers Pittman used an inflatable air mattress to rescue her and my stepfather from a house filled with chest-high stormwater. They were clinging to the front porch. Others, like my cousin Dashawn Thompson, raced in small rowboats to rescue anyone else whose house was becoming a death-trap. It appears at this point that everyone is accounted for, even if only sketchily. Many have lost everything they own — especially those who (like my mother) have homes in the low-lying eastern and southern ends of the Turkey Creek community. They need water, food, bleach, tarps, generators and so on. I have purchased two truckloads so far with nearly "maxed out" credit cards. I hope to fill two trailers in Birmingham with more. Thank you for your continued concern and assistance. Thanks to all those who have inquired about my safety and well-being. The e-mails and phone calls that I've received from everyone have been very reassuring during this time. I was able to get out of the city the day the Hurricane hit and have taken temporary refuge in North Carolina. Due to the fact that I have limited internet access,�you can contact me�by�cell phone at (516) 662-4834. Please keep the people of Louisiana and Mississippi in�your thoughts and prayers. Being that I live in the heart of New Orleans, I had to leave at 5 am on Sunday morning due to the mandatory evacuation. It took 14 hours to get to Houston and I am now in Austin, TX. Since we don't know how long it will be until we can get back into the city to help, I will head back to the NJ/NY area and wait it out. As a healthcare worker, I am trying to see how quickly I can get back down and contribute to any relief and repair efforts on which my colleagues are currently working. This is a horrific disaster and I am thankful to know that the Boston College community will be amongst the many�generating prayers�in this direction. 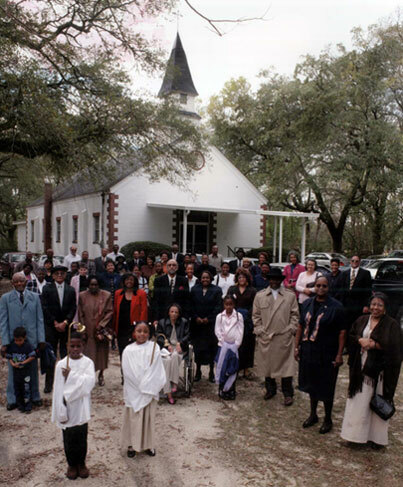 Along with my family, I evacuated the day before Katrina hit the New Orleans area. We have been moving around the past few days but will be going tomorrow to Lafayette, LA where my family has rented a house. I do not know the status of my apartment or my family's homes, and it may be some time before I am able to return to the city. My husband, Bob (Ed '74) and I live in Mobile, Alabama and are doing well following Katrina. Bob is a main news anchor at the FOX TV station here and has been on-air frequently before, during, and after the storm. He also anchored newscasts directed at New Orleans, as the FOX station there was buried hip-deep in water and muck. Southern parts of Mobile County were devastated, and downtown Mobile was flooded to a depth of several feet. Fortunately, water receded fairly quickly. More than 100,000 people are still without power and will be for up to a week. However, Mobile and Baldwin Counties of Alabama were quite lucky in comparison to Mississippi and Louisiana. Many coastal towns have been literally wiped off the map, and New Orleans will never be the same. I fear that the death toll will indeed be in the thousands, both from the storm itself, and from the disease which will follow. Please keep all residents of those areas, many of whom have lost literally everything but their lives, in your prayers. Marie Sheehy Grip (A&S '74) and I (Ed '74) live in Mobile, Alabama. We were without power for a couple of days and lost so many tree limbs and branches that we couldn't see the grass in the front or back yards. Luckily, none of the branches struck our roof. I've worked as a news anchor in Mobile since 1975, and have never seen a worse hurricane. The most extensive damage was caused by the storm surge. We've brought our viewers pictures of a mausoleum gutted by 35 foot waves, scattering caskets in the mud, Catholic churches along the Mississippi coast that simply disappeared and bridges on the major east-west interstate highway (I-10) that have been destroyed. It will take years for this area to recover. Brian and Tess (class of '76 — A & S and SON) went to an extended relative's house in Gonzales, LA, just south of Baton Rouge. Our family, Matthew (26) drove his truck with us, Timothy (22) went with his girlfriend, Michelle, and her family to Mississippi (but are now in Franklin, LA, near Houma). Gwyneth, our daughter (20, BC class of '07 A & S) is working in Nantucket and is near her Uncle Jim and Aunt Carol (BC Class of '74). Our neighbor, "Aunt Catherine" (86) came with us to Gonzales. Timothy took the 5 cats with him and we took the two parakeets. Tess is working at the Red Cross Evacuation Center, helping to coordinate the medical/nursing efforts. It has been a challenge there. So many people didn't bring anything as they thought it would be a day or two and their medical needs are so vast. Luckily there have been dislocated doctors from New Orleans who have been able to write prescriptions for needed medications. Several people have needed to have been evacuated to local hospitals because of worsening medical conditions. Tess teaches nursing at Our Lady of Holy Cross College in New Orleans, but there is no indication as to when that will resume. She has been helping to triage, organize care and direct the medical/nursing efforts. Conditions at the evacuation center are OK, but there are armed National Guard present to maintain order. All of the evacuees are from the New Orleans and many have lost everything. For now, it is OK, but you can sense that people are starting to despair and lose hope and it is heartbreaking. Adding to the mix is the continuous "all disaster all the time" media coverage that just serves to heighten the already palpable tensions and it could make for a combustible mix. But so many of the people in the shelter are gracious and thankful—the true spirit of New Orleans and Louisiana—we may not know you, but in times of trouble, you are our neighbor and we will do our best to help you in any way that we can. And the people in Ascension Parish have done so much to try to help alleviate the sorrows that we from New Orleans are experiencing. We had heard that our house actually came through unscathed from the hurricane, but feel that will fall prey to looters. We hope that it will not be burned to the ground in retribution. However, we are consoling ourselves that we are safe. And in the grand scheme of things, that is all that matters. Material things can be replaced. Lives cannot. Brian works for Shell and will relocate to Houston. Matthew's job will now be functioning from Houma instead of Belle Chasse and he will resume this soon. Timothy has resigned himself to graduating from college in May or at some point rather than December to fulfill his dream of being a high school biology teacher. His girlfriend, Michelle, and her family have lost everything—their home, their possessions, everything. Tess will be ok—she is a nurse, has a PhD in nursing and can either function in the hospital or teach in a school of nursing. Please pray for all of those who have been affected. This is our tsunami. Our thanks go out to all who have contacted us—a pity that it takes a disaster of such magnitude to re-connect. For Boston, For Boston, we sing our proud refrain. Thank you all for all your prayers and thoughts. May we only hope to return them to you at some point. I currently live in Houston, TX, and while the weather is fine here, we are experiencing a tremendous influx of refugees.� I teach high school and we are receiving students each day who are being housed at the Houston Astrodome. It is a bit overwhelming to see how completely distraught these people are, and to hear them talk about what has happened to them in the past several days. I would encourage every member of the BC community to donate to these people. Hi this is Colleen Leary. Dec '98 grad. Currently, I live in Houston, TX, but I am from Long Beach, MS. Almost all of my family still calls that home. Fortunately, all of my family are safe. Some of them have homes to go back to, some don't. Most will likely not have jobs to return to. I grew up in a house just one and a half blocks from the beach and, amazingly, it is still there! We believe that it may have had some water in it. Watching footage of the MS Coast is unreal. I am looking at a place that is my "home" and yet many times, I cannot get my bearings, because there is just so much destruction. I looked at satellite imagery today, and it took me a very long time to find my street. Most of the landmarks along the Coast are gone or not where they should be. I don't think it will really sink in until I am there and see it for myself. However, I will not return until it is safe, or my family and friends need me to go get them or bring in supplies. I thank God for my family's safety and hurt for the families that were less fortunate. I am unable to reach many of my friends that stayed there. Only occasionally am I able to text message my best friend, but at least I know she's ok. People from my town who have since moved to other places are all pulling together to get information out to others as to who is ok and what they know about people's houses. I didn't intend to write so much, but I am feeling so much that keeping it short just doesn't seem possible. If anyone needs more information, I'd be happy to help if I am able. Thank you for your concern. Apart from several days without electricity, water or phones, we are fine. I remember that most all the other Southerners that were with me at BC all hailed from New Orleans. My heart cries for all the people in New Orleans and the people of southern Mississippi. If there is a BC person/people who are in need, my husband and I have a guest bedroom and bath in the suburbs of Atlanta that is open. I'll be in Mississippi for the next few days and the cell phone may not work. But please leave me a message and I'll get back to you as soon as I can. Please pray for the Gulf Coast. Here in Fairhope, we were�on the western edge of the storm, and so were spared the full force of Katrina. Low lying areas to the south and west were badly flooded, both along the Gulf and Mobile Bay. The destruction to our west is truly beyond belief.�The wonderful towns and people of south Mississippi took the brunt of this hurricane. Please remember them and the people of Louisiana with your prayers and be generous with your support.�I know you will. My name is Colleen Donovan and I'm a 1999 graduate of Boston College. I work as a reporter and anchor for WDAM-TV in Hattiesburg Mississippi. Our area was badly damaged from the hurricane leaving many people homeless, not to mention the lack of water and power. It has been almost a week since the hurricane struck and it is a great sight to some power being restored to certain urban areas of Hattiesburg and neighboring city, Laurel. Also, water service has been mostly restored to urban areas. However, power for the most part is out. There are limited means of communication—if any, and we hope people can see our broadcasts through battery powered televisions. I have been reporting on this disaster since the storm blew in, and it is so upsetting to meet the people in the shelters from the Gulf Coast and New Orleans areas who are desperate to find out if their loved ones are ok. There is a real shortage of medical supplies at one shelter I reported from today and the high temperatures of Mississippi aren't helping. Our immediate areas are also in great need of assistance. My apartment was damaged from the hurricane, but fortunately I have friends I can stay with until I can find another home. I am very lucky, and at our station we have received essential supplies from our company to help all of the employees. I have personally never experienced a disaster like this and it helps to write about it. I was just able to check my e-mail today. It is so nice and comforting to know the Boston College community cares so much, and I know any donations to service organizations helping in the affected areas would be greatly appreciated. Thank you all very much for your thoughts and prayers. I'm Alyssa (Bridge) Carducci, CSOM '03. I was a Tulane Law 3L in New Orleans. I was so blessed and evacuated to Charlottesville, VA, safely and securely on the last flight out of New Orleans on Sunday. Out of the goodness of their heart, UVA Law has accepted me a visiting student so that I may graduate in May. I will be joined by 13 other Tulane Law students. UVA is conducting a special orientation for all displaced Tulane and Loyola students (there are 100 of us going to UVA) on Sunday. They have peer advisors, deans, and academic personnel scrambling so that we may finish our academic plans. I will also be joining several other BC alums at UVA Law, the majority of whom I have already met and have very kindly extended offers of assistance. Please continue to pray for those not as fortunate. As a 1979 BC alumni, I have lived in New Orleans for almost 25 years. I evacuated from New Orleans to Dallas (Mansfield) and stayed with my brother Doug. My family is all safe. I have not been able to ascertain the condition of my house nor my business. I have heard all kinds of conflicting reports. Tommy Kurtz, also an alumni is safe in Houston, I believe. As bad as you think it is, it's worse. Please pray for all those who have it a lot worse than me and in that regard, I am blessed. My wife Emily and I are safe and temporarily living in Florida. Most of you know I am stationed here, however Emily was about to begin her second year as an MSW student at Tulane. She had been living in New Orleans (Kenner) for almost a year when Katrina ripped through. This was actually our third hurricane (Ivan, Dennis, and now Katrina) we have been in the path of in less than a year. We have evacuated for all three, and let me tell you, it is a horrific experience. We have been extremely fortunate our home has only taken very minor damage, however our apartment in NO might be a different story. All signs and information indicate we have not been flooded, however we have no idea as to whether or not thieves have helped themselves to our place. Nonetheless, that is only materialistic, since we have the most important things...each other and our pets. We plan to return Monday morning, however not sure what, if anything, we will be returning to. BC has actually offered assistance to misplaced students, and Emily has begun the process to enroll for the fall semester. It is great to know we were part of, and graduated from, such an outstanding institution. Thank you for all of your thoughts and prayers, please continue to keep praying and donating any items you can for those who are not as fortunate as all of us. I can be reached at jimmacdonald@hotmail.com or james.macdonald@navy.mil. I live in Baton Rouge. My family is fine. I would simply call on the BC alumni to be generous with contributions to the Red Cross, Salvation Army, etc. Baton Rouge will need a great deal of assistance since our population has greatly increased...some of that increase will probably be permanent. In addition to financial assistance there is a great need for clothing for all ages. The majority of people that evacuated did not foresee being displaced for weeks and possibly months. I know the generosity of the BC alumni community will be overwhelming. I am happy to inform you that my family and myself are safe. We are, however, dispersed throughout the Southeastern United States. I believe that my home is still intact. It may have received a few inches of water, but I know that it is still standing due to the ability to look at satellite pictures of the area. I am currently looking for a job teaching in the Baton Rouge area (as I had just begun teaching in New Orleans). As for now, the best method of communication is email because phone systems are still down. I can be reached at denisemboyce@hotmail.com. I am so grateful for all of the wonderful people from the Boston College community who have extended their sympathy and help while we struggle to recover the city of New Orleans. I have received numerous emails from my friends at Boston College who are praying for us. We appreciate all that you do! I am not sure if you are receiving requests from anyone for a place to stay but I am a 2000 and 2002 BC grad living in Austin Texas with a spare room for anyone who needs to relocate. I can be reached at geierj@mail.utexas.edu. I am from Covington, LA which is about 40 miles north of the city. We suffered a lot of wind damage in St. Tammany Parish. Lots of trees on houses, and power lines down. The recovery will be a long one, but we are blessed that we have something to eventually go back to. My family and I evacuated to Baton Rouge, where I am now living with my brother until power and clean up is complete. My parents have gone to live with my grandmother in Pennsylvania, and will live there indefinitely. We are all safe, and our homes are intact, so I feel very blessed. I recently went back to Covington to survey the damage, and the devistation on people's faces was just heartbreaking. I tell you, it hits home when you see it for yourself. The best way to describe the area is a battle zone. My family and I evacuated safely to Baton Rouge, LA and will remain here indefinitely while our city is rebuilt and we all try to cope with this catastrophe. Thank you so much for your concern, prayers, and love. I'm in the class of NC '75. Katrina bypassed us in Ocala, FL. After being hit by 3 out of 4 Florida hurricanes last year I am concerned about the whereabouts of a classmate from New Orleans, Rosey Grenier, NC '75. I am offering help, a place to stay in Ocala, Florida. Rosey and her family opened their hearts and home to me when I was at Tulane in '75. Please post this in the hopes that Rosey will see it. I currently am an Assistant Director with the Department of Residential Life on the LSU campus. Considering all that is happening around me, I consider myself very lucky to only have lost power for 24 hours. Baton Rouge was spared the wrath of Katrina, except for power outages, downed trees and very minor flooding. Mother nature went easy on us so that the community of Baton Rouge would be ready to help New Orleans. What is going on at the LSU campus and in Baton Rouge right now can only be described as surreal. BR has doubled in size this week and our entire Residence Life staff has been focused on getting refugee students (from University of New Orleans, Tulane University, Xavier University, and others) housing. Besides refugee students, we are housing many many members of FEMA, FBI, and local energy workers in our Residence Halls. We have families living in our residents' rooms with pets and children. I cannot count the number of students and staff I have talked to that have lost everything to this terrible storm. Folks have lost homes, family members, and some are beginning to lose hope. facilities--helicopters fly overhead all day and ambulances scramble around campus. It's only going to get worse as more and more people are rescued from New Orleans. LSU suspended classes the entire week and most students are eager to donate, volunteer and be shoulders to cry on. I want to encourage all who read this to DONATE TO THE RED CROSS. This is the largest humanitarian effort in the history of the Red Cross, as they are responding to the largest natural distaster in US history. The relief needed to get through this will surpass all four hurricanes that hit Florida over the last year. Not only are victims in need of basic supplies (that up until Monday I took for granted), they will need tremendous support in the future--there are going to be so many survivors with nothing. THEY NEED YOUR CONTRIBUTIONS. If you would rather send things, please reference the list below of supplies that are badly needed to assist all those in need. If I can be of assistance to you, please feel free to email me at lkimball@lsu.edu. Please keep all of us in your thoughts and prayers. Please purchase a box of baby diapers or cans of baby formula or any of the items on the supply list below, put a shipping label on it and ship it directly to the Louisiana State University at the address shown. Mark it "Katrina Relief". The Student Health Center at LSU in Baton Rouge has set up a makeshift medical facility in the campus field house. They have been working around the clock caring for the sick and injured victims of Katrina, but they are in desperate need of supplies NOW! ATTN: Dr. Timothy Honigman for "Katrina Relief"
Janet Roby Sanchez (SON '79) evacuated with husband Alex & 12 year old son Matt to Franklin, LA (south of New Iberia). Our concrete home survived the aftermath of Katrina with the loss of only fences & trees. We live in Metairie, adjacent to New Orleans, & had no water damage. We feel extremely lucky although are saddened with the unimmaginable losses our friends & neighbors have. We hope to return home by October. Matt misses his school friends who are scattered throughout the South, from Austin, TX, Memphis, TN, to Destin, FL. We are blessed to have a home to return to and miss the community that makes New Orleans home. My name is Elizabeth Stowe and I just graduated from BC this past year ('05). I am currently doing a program through the University of Notre Dame, known as the Alliance For Catholic Education. It is a 2 year Masters/Service Program, where I attend classes for 2 summers at Notre Dame and then get placed in an under-resourced Catholic school in the south to teach for 2 years. My placement was St. Peter the Apostle School in Pascagoula, MS. I completed my first summer of classes for my Masters in Education at ND and moved to Pascagoula. I taught second grade at St. Peter the Apostle School, which is the last mission school in Mississippi. 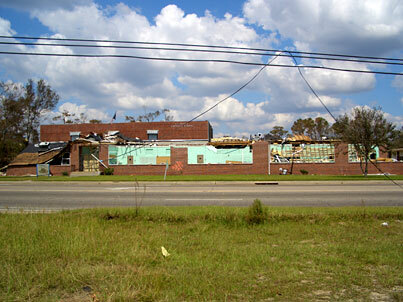 We had been in school for 3 weeks before Katrina hit. I evacuated Pascagoula and went to Jackson, MS for the storm. For the past 2 weeks I've been wandering around in the south. I went to Mobile, AL, Pensacola, FL, and Jacksonville, FL, in search of electricity. I have since made my way back to my new "home." I am currently staying in Mobile, AL, and commuting to Pascagoula, MS everyday. The school was destroyed in the storm. The convent, where our Principal, Sister Bernadette, lived with two other sisters from Ireland, was flooded. This past week I have been helping her clear out the convent, as everything was destroyed. The children are to begin school October 3rd at Resurrection Elementry School, which is another Catholic school close by. We have received word that St. Peter's will be re-built. The students will return to St. Peter's when there is a structure for them. As St. Peter's was a Catholic School in need before Katrina, it will be in need of any help it can get. Once I got to a place with electricity, I saw BC's website and figured I'd fill you in a little more on Pascagoula. Don't have more than a minute to drop a quick line to say hello and offer thanks for publishing your Hurricane Katrina communication site in such a timely manner. I'm a '98 grad of A&S who majored in Environmental Geoscience and played women's hockey, tried my hand in the world of finance, and finally opted to pursue a flight career with the Coast Guard. 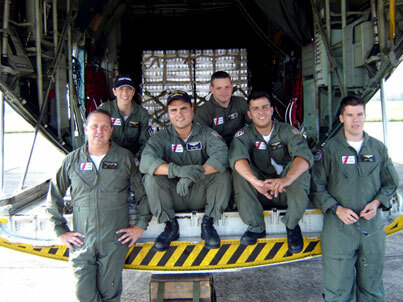 I'm currrently a C-130 Hercules aircraft commander for the USCG out of Saint Petersburg, FL. 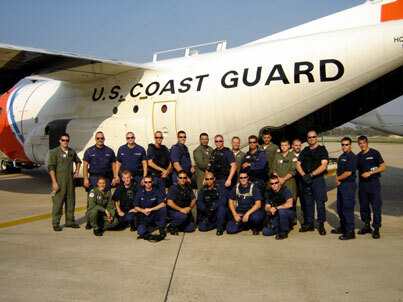 Members of my unit were among the first on scene after Katrina passed through the Gulf Coast, and responsible for over 2000 rescues. As everyone has seen by now, the devastation was unreal, but the outpouring of human compassion was amazing, and still is. Although I wasn't directly affected by the storm's fury in the sense of personal loss, I flew over the area as the first airborne communications platform and command and control center for all of the rescue helicopters on scene the very first night and into the morning, assisting in saving over 500 lives, and made many subsequent trips directly into New Orleans with supplies, and law enforcement and rescue teams, witnessing firsthand the destruction and tragedy. My heart goes out to all those who have endured so much suffering from this horrible and far-reaching storm, and if I am in a position to be of help to any alums or their families, I'd urge them to contact me through this email address. My thoughts and prayers are with all the victims and survivors of the storm.